I just HAD to go and buy myself another self-help book. I'm sorry/not sorry folks...it's a compulsion I've had for many moons. I'm not sure that they're doing any good really, but I so love reading them. This newest selection is about a subject I very much need to work on despite this not being my first book to delve into it...and that subject is Habits. 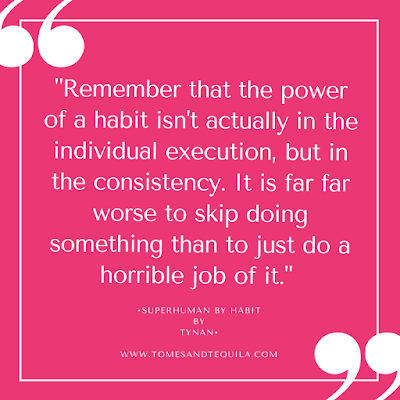 I have got to be one of the absolute WORST people in the world when it comes to good habits and habit building in general, and it's something I desperately want to work on...so what do I do? I buy yet another book about habits! 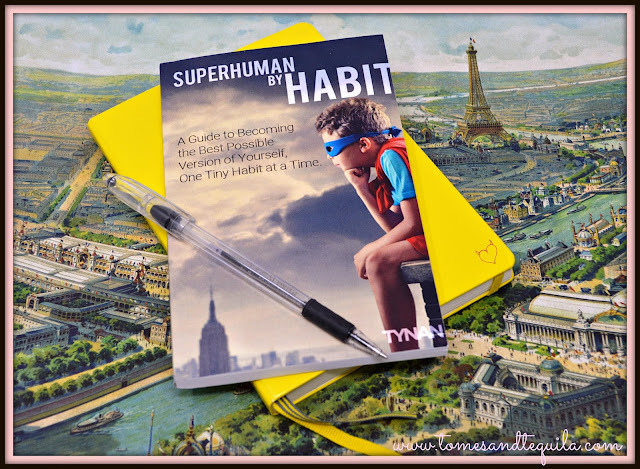 This one being a small paperback called Superhuman by Habit: A Guide to Becoming the Best Possible Version of Yourself, One Tiny Habit at a Time by Tynan. Now I've previously written about Gretchen Rubin's book on Habits called Better Than Before: What I Learned About Making and Breaking Habits--to Sleep More, Quit Sugar, Procrastinate Less and Generally Build a Happier Life. I think that's a great book with terrific concrete steps to help you set up new habits and stick with them. Have I done a great job at implementing them, and completely changed my life for the better?? Um...no. So I figured a new book was in order. This new book, Superhuman by Habit, is a whole lot smaller and infinitely more basic than Gretchen Rubin's book...but I'd still say it's a useful tool to have in your arsenal if you're someone like me, and you really struggle with structure in your day and forming good solid habits in your life. The author really breaks down how having a solid routine of regular habits in your life frees your mind from constantly having to make decision after decision. He also lists his rules for establishing good routines and sticking with them including things like not missing two days in a row. There is also a section where he analyzes what he deems to be some good habits worth trying to include in your life. Despite being recommended by more than a handful of folks in a Facebook group of like-minded self-help addicts, at only 101 pages this book didn't really tell me a whole lot I didn't already know, so I'm giving it 3 1/2 stars. If you're looking for a starter book on building better habits, this would be a great first book to pick up, but if you're looking to delve into it a bit more this one probably isn't going to give you too many applicable gems. Now I just think I need to read The Power of Habit!! Do you have any good self-help/personal-development books you think I might like? If so, let me know in the comments here or over on my Facebook page!